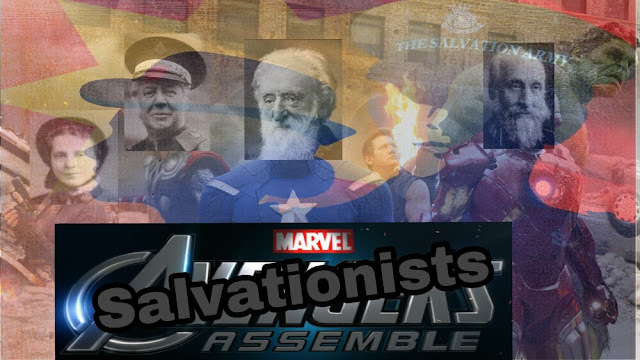 Inspired by Faith: Salvationists Assemble!!! "There was an idea, Booth knew this, called the Salvation Army Initiative The idea was to bring together a group of remarkable people, see if they could become something more. See if they could work together when we needed them to to fight the battles we never could." Before we get started I'll admit that this is probably the cheesiest post I've written...but I think it's an important message so I hope you'll stick with me. Maybe you're already humming The Avengers Theme tune ...and hopefully you'll forgive the shamelessly ripped off and plagiarised quote from Nick Fury...but this really was the idea behind the Salvation Army...to be an organisation of heroes, faithful champions who would storm the forts of darkness and fight against hate, injustice, homelessness, social inequality, faithlessness, and hopelessness. calls to you and bids to you to come. hands and shouting of praises - very much of heaven on earth. the midst of these perishing multitudes, whatever it may cost you. happiness from now on will consist in sharing their misery, your ease in sharing their pain, your crown in helping them to bear their cross, and your heaven in going into the very jaws of hell to rescue them." Click Here for a shortened but dramatic reading of this vision for the lost and the mission of Salvation Army and wider Church. The days of sitting back and avoiding conflicts are gone...the world needs us. Just as in William Booth's day, the needs of our fellow man are crying out to us. We must decide how we will respond...right wing hate groups seem to be everywhere as is 'casual' racism, Brexit is dividing communities, terrorism haunts our steps, gun crime seems to be on the rise, and our politicians and leaders appear to be only interested in themselves and not the common good...if we're looking for examples of heroes and champions...they won't be found there....no wonder we seem obsessed with superhero movies at the moment...we seem sadly lacking in real world heroes. That's where we come in...we are called and empowered to be beacons and lighthouses in the storms of this world, guiding people to God as is the entire Church of course. But...and this is a big but...you'll never find an active lighthouse in the middle of a field, miles from the ocean... because that's not where they're needed... that's surely what Booth's vision is all about... meeting the needs around us where THEY are, instead of where WE are and where WE are comfortable. Sometimes being a hero and fighting against all the things that we are called to fight against; means stepping out, being unpopular, leaving our own comfort zones, and taking the fight far behind enemy lines...we spend so much time and energy as a Church trying to attract people into our buildings and events... when really we should be putting this effort into inspiring and encouraging those within our congregations to get out of our buildings and out into the streets where the battlefield really is... otherwise we're just lighthouses in a field, giving light to each other...which for the record is definitely not a bad thing... it's important and necessary to build each other up and be beacons for each other, keeping ourselves on track, on task, on the right path and of course in the light... but that's not where our mission should end! Within a yard of hell." So my advice and encouragement for those interested, is to build yourselves, strengthen yourselves, trust and believe in God. Do what you need to do to reach your potential... heroes are not built overnight...Iron man spent years perfecting his armour, Captain America spent years building his character, determination and integrity before the super soldier serum gave him his physical powers, Thor had to experience life without his powers to discover who he really was and could become, Hulk had to learn to embrace his powers and potential to become more than a mindless beast... and the list goes on...every hero took time and effort to really reach their full potential and become true heroes.